"A story about terrible superpowers, the terrible people who hold them, and the terrible people who do not." 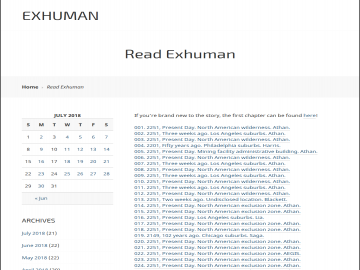 Exhuman is a free ongoing web serial which updates three times a week. It takes place in 2251, in a world where nuclear wars have come and gone, superhumans (the titular Exhumans) appear at random and cause devastation, and people haven't changed at all from the 21st century. It is a dark story which follows the life of Athan Ashton, an 18-year old who wakes up to find himself a lightning-powered Exhuman. Following a failed imprisonment and execution, he is exiled. Athan struggles with his new life as an Exhuman, and encounters new and interesting personalities as he moves forward, some who fear and hate him merely for being what he is, and others who suffer the same bigotry as he. Life can be difficult for an Exhuman, and the world can be a crappy place, but happiness is always possible for those who remember to look for it. Exhuman has not been tagged yet. Help others find Exhuman by tagging it! Exhuman has not been reviewed yet. Exhuman has not been recommended yet.